Well it might still be cold out there but the days are starting to get longer, its light until nearly 5pm now! With the days getting lighter we are getting ready for hatching 2019. The big incubators are out of storage will be geting eggs in from the start of Feb. We still have some space in our diary for hatching bookings, please get intouch for more info. 2 new cockerels have joined the flock at Hens HQ, Vlad and Bjorn. Pop over to our Facebook page for all the photos and updates. Did you know that we do speaking visits? 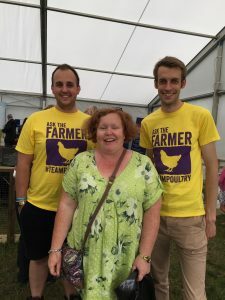 Yes we do, visits to WI meetings and luncheon groups, if you would like us to come and chat all things chickens, please get in touch. 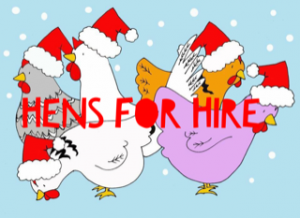 Merry Christmas from all of us at Hens for Hire! Its been a busy few weeks for the little hen van, all the school hens are now back at Hens HQ for the holidays. The hens are all checked in at the hen barn, they have had their health checks and have settled into their holiday homes for the next few weeks. We are looking forward to a lovely festive few weeks, visiting friends and family. The good news for having the hens back at Hens HQ is that we have eggs again! (sadly the retiree hens haven’t really been delivering on this front recently!). So if you are passing and need some eggs for Christmas baking please visit our honesty box at the top of the farm drive. 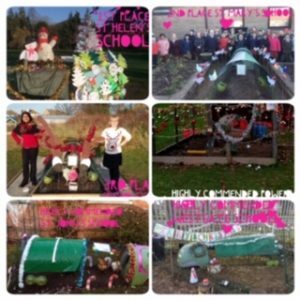 Our schools have really got into the festive spirit and we have had some wonderful enteries in our Christmas Chicken Coop Competition! 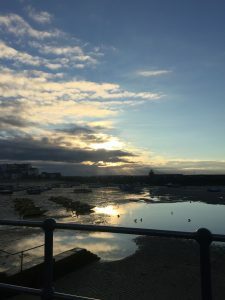 Our course dates for 2019 are now live on the website for both the Hens for Everyone & Introduction to Photography Courses. Stuck for a last minute gift? Do not fear we have you covered we offer gift certificates for all our courses, just drop us an email. We have lots of EGGciting things coming up for 2019 so please keep an eye on our news page for all the info. 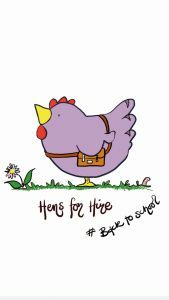 It has been a busy Autumn half term here at Hens for Hire, hens returning back to school and new schools joining the Hens for Hire family. The mini hen van has travelled a few thousand miles criss crossing the country. We have had chicks hatching at the Stan Bull Centre in Walsall, the day centre vistors have enjoyed the chick cuddles. 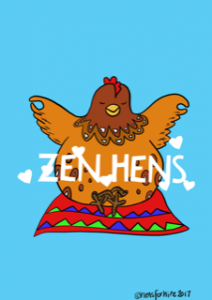 We have launched a great new school project all part of our mindfulness project, meet our Zen Hens (for schools hiring with us check your inbox for all the info and they will soon be added to the Chicken Club). 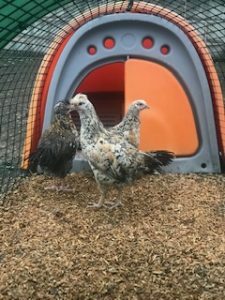 we have had some new additions here at Hens HQ, meet our new Swedish Flower Hens they are only 10 weeks old more info on them as they settle in. 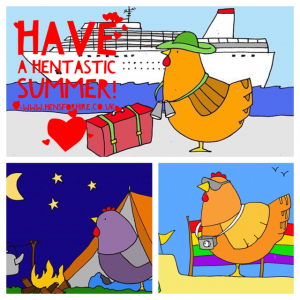 Both the hens and I would like to wish all our schools and teachers a happy summer break and we will see you in September! It’s with very heavy heart that we had to say goodbye to the Little Yellow Horse. Despite all the best efforts of the staff at Pool House Equine Hospital. What we thought was colic this morning, wasn’t & she was basically in the start of septic shock due to a massive rip in her small intestine. We rushed her into the hospital & the staff were brilliant but sadly it wasn’t meant to be. She was only nearly 8 & been part of the family for 7 years. She was a force of nature & full of life a totally Miss Sassy Pants. 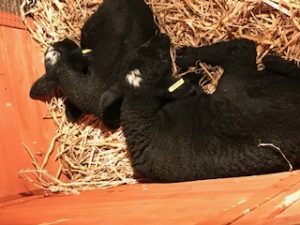 Meet the new addtions to Hens HQ, Ted and Little Alfie the orohaned lambs. 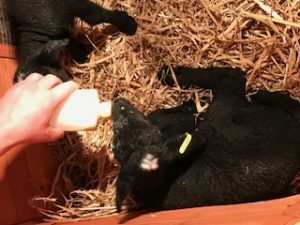 They are just over 7 days old and doing really well we are all enjoying bottle feeding them and of coure lots of cuddles! Better photos to follow once the weather improves! ‘Tis the season for Chick Cuddles! 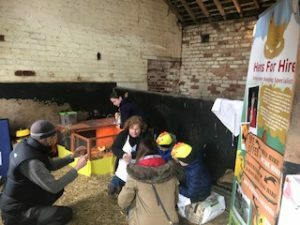 We have had a very busy run up to Easter here at Hens HQ, we have hosted lots of chick cuddle sessions at nursery schools, primary schools and at farm Easter Parties. Our chicks were EGGcellent and very well behaved and the children, staff and parents really enjoyed the experience. 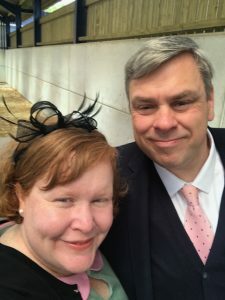 If you would like us to visit your setting or event, please get intouch. As the Beast from the East and Storm Emma are battering most of the UK, here at Hens HQ we are struggling with the weather. Our farm is covered in snow and we have 4ft snow drifts coming off the fields. We spent 2 hours until midnight yesterday digging out a selction of vechicles including gritter lorries and cars all stuck on our road(we are on a main road). The snowploughs have been on patrol and cleared some of the road and very kindly piled up 4ft of snow at the entrance to the farm. I am a bit worried that if this weather continues it will effect our incubator set up next weeks. I will be keeping a close eye on the weather forcasts. If you want to see our fun in the snow rescuing drivers please check out or facbook and twitter feeds. Chick Cuddle Sessions- Aimed at Nurseries, perfect for little hands and attention spans! 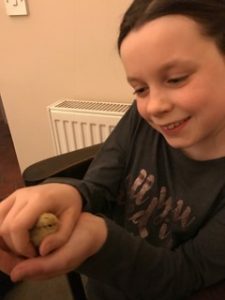 Our sessions last for approx 45 mins, where children and staff will get hands on handling with a selection of our lovely fluffy chicks. We also have a selection of dressing up clothes, chick toys (for children not to keen on handling the chicks) plus a few songs! All the materials and live animals. Travel to and from your location. If your location is further afield please get intouch for a price. For more info please visit our Eggtivity Days page. Bookings are quickly filling up so get intouch so you dont miss out. Today Defra announced a Enlgand wide prevention zone due to 2 reported cases of Bird Flu in wild birds. All schools who currently hire hens from us, please check your inbox for the latest update and risk assessment details. Poultry keepers and members of the public should report dead wild birds to the Defra helpline on 03459 33 55 77 and keepers should report suspicion of disease to APHA on 03000 200 301. Keepers should familiarise themselves with our avian flu advice. We are going EGG Crazy! Not to mention we are the only hatching company to offer our unique ‘Watch us Grow’ package. 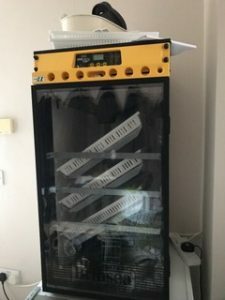 Pop over to our incubator page for all the details. 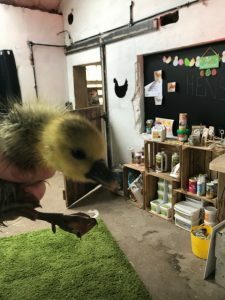 New in the Hens for Hire Shop are Gift Vouchers that can be used on all of our courses, pop into the shop for more info. Released today are all our course dates for 2018 book early to avoid disappointment. We will also soon be launching our new Animal & Woodland Safari Photography courses……..watch this space for details! 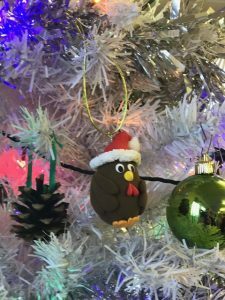 The Hens for Hire Chicken Christmas Coop is OPEN!! Our ‘Helfs’ are hard at work adding the finishing touches and the doors to the Online Shop are now Open! We have some EGGtastic products, stick you beak in the shop for a quick peek! Not to blow our own trumpet but our EGGtivity Days are HENtastic! Brand new for 2017 we have 3 themed Days all based around the Humble Hen! Lifecycles, Historical Hens & Egg Scientists. We provide all the materials, costumes and hens (plus chicks). 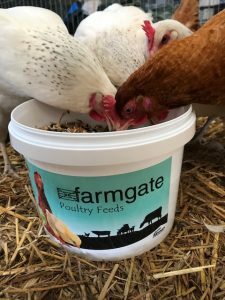 We are the country’s leading Hen Keeping Specialists and we love to share the joy of hens. We want to take your learning beyond eating eggs. For more information please visit the EGGtivity Day page or contact Claire. To Early to Mention the C Word? 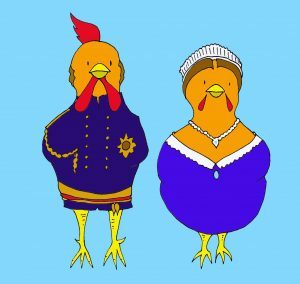 Historical Hatch-Hatch some of Queen Victoria’s favourite breeds, learn how she started Hen Fever! It has been a busy few weeks here at Hens HQ, getting the hens back to school for the start of the school year. We have visited 25 schools, and settled in hens back to settings around the country. Some hens are on their 2nd and 3rd years back at school and for quite a few of the girls it was their first day of school. The good news is they have all settled back in, if you want to see their first day of school pictures please visit our Facebook Page. We have some very eggciting new products making their way to our new look shop, unlike poultry supplies our shop is a little different. 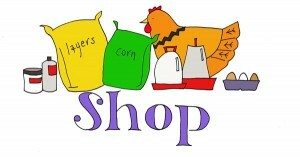 During our monthly Hens for Everyone Courses, we open our hen supply shop at Hens HQ. We offer layers pellets, bedding, hen care sprays and powders. Our online shop offers something a little different. 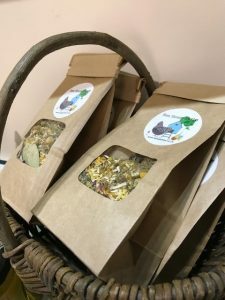 You can now purchase our Hen House Herbs , which I use in all of our coops here at hens HQ. Along with some of our fun and ‘EGGucational’ products. Have a browse and get shopping, we are still waiting for a few products to arrive and will update the shop as soon as they do. All the chickens have come back from school for a little R & R here at Hens HQ. 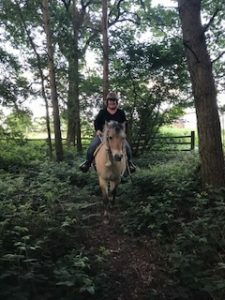 If you follow our Social Media Pages you can keep up to date on all of their Summer activities. 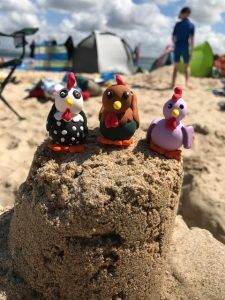 We have been for a little trip away from the farm, a week in St Ives but of course we couldn’t go without some of our EGGventure Hens. 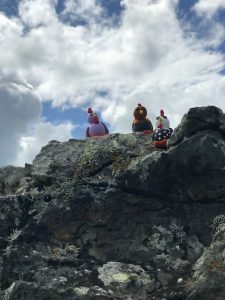 Here are just a few of the pictures of thier eggventures. 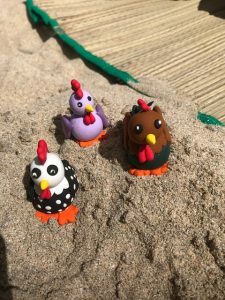 Our EGGventure Hens are a great addition to any classroom or family, for poultry loving children they can go with them on trips or away for the weekend or even on mini EGGventrues around school. 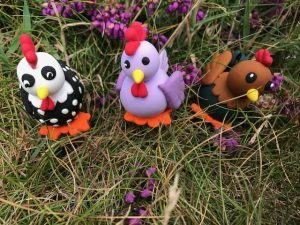 We creat a range of hens all made from ‘Jumping Clay’ which is totally safe and easy to clean. For schools who hire hens from us they are included in your package. If you would like to purchase them, please visit our shop for more information. 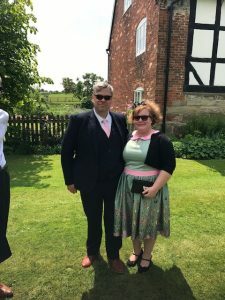 On Friday 2nd June I was lucky enough to join other like minded poultry people from around the country at Warwickshire Chicken Coop. It was a fantasic day or should I say HENtastic day all organised via Instagram by @YorkshireFeathers. 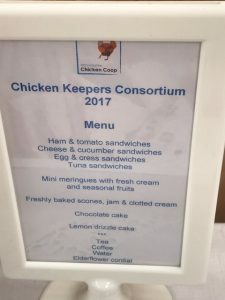 This is the second year of the CKC, it was a great opportunity to share the joy of hens with other chicken keepers and to listen to some interesting and inspirational speakers, eat lots of lovely food and cake and do a spot of shopping. Sso how did the day shape up? have a quick look…. 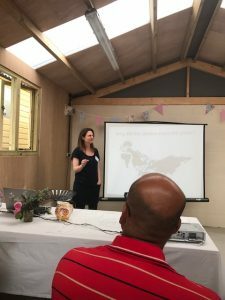 TALK from Dr Naomi Sykes from The Chicken Project Why did the chicken cross the world? 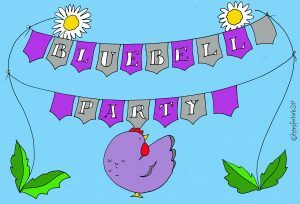 The Bluebell Party won the most votes through our social media platforms. Thank you to everyone who cast their vote. With less than a week to go we are feeling EGGlection fever! 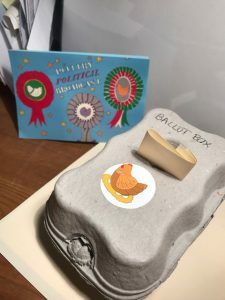 We hav had a go at creating our own ballot boxes and ballot papers we hope this gives you some ideas for your own school EGGlections on Thursday. 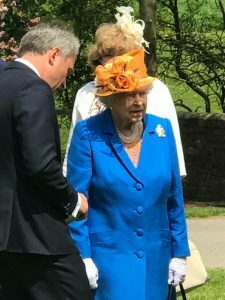 A couple of weeks ago we were lucky enough to be invited to a private lunch with Her Majesty the Queen. 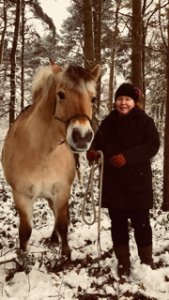 It was an amazing experience and we were able to be introduced to her and talk to her (about hens and horses!). 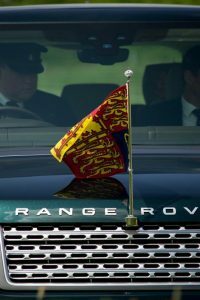 Here are just a few picutres, offical ones to follow. Let me introduce Captain & His First Mate, they are part of our Historical Hens team. We love to share the history of hens and how they became part of our everyday lives. 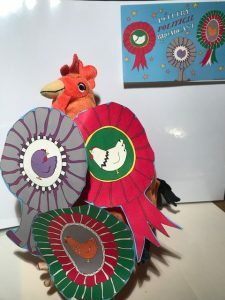 If you would like to know more about our Historical Hen Days (all part of our EGGtivity Packages) please visit the page. 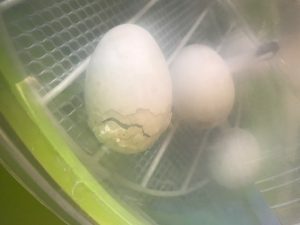 It have been a very EGGciting time, 2 of our lovely schools have hatched their first duck eggs. 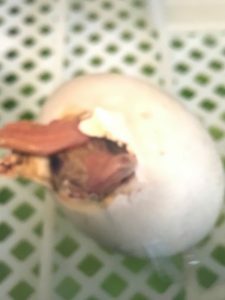 Duck eggs are just one of the EGGtastic hatching packages that we offer, if you would like more information please visit our Incubator page. 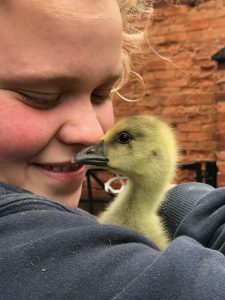 The little wild goslings who found their way onto the farm 3 weeks ago, they really have grown! They have settled into farm life well and are thriving. The plan is to find them a more suitable home. For now they seem to be happy. 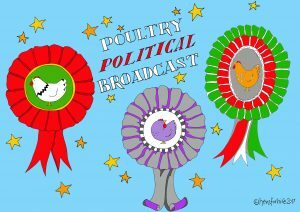 It is election season here in the UK and the hens felt it was time for their Poultry Political Views to be heard. 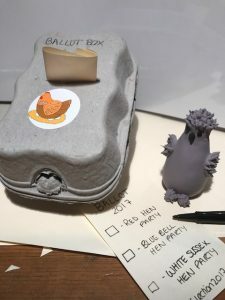 We are putting together our own Poultry Political Boradcast Packs, so that students and teachers can have some politcal debates and vote for the Polutry Party they think should be in power, casting our votes on June 8th. To all our schools please login to the ‘Chicken Club’ for all the information. We currently have 2 unexpected house guests in one of our nursery pens. 2 Canadian Goosings. They literally knocked on the back door and following my Mum around the farm yard. We have searched high and low looking for the rest of their family without any luck. So for now they are enjoying some Hens for Hire hospitality. All ready to send to out to schools this week, our fantastic Hen House Herb Boxes. 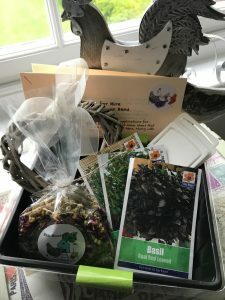 A handpicked selection of herbs to grow at school along with all the information on how to add herbs to your hen house, a wreath to add herbs to, that can be hung in the hen house. Along with a our belended dried Hen House Herbs to add to the hen house and run. Soon to be avaliable in our shop too. 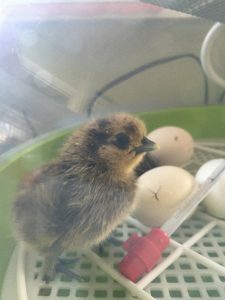 Last week was our first incubator hire of the 2017 hatching season. 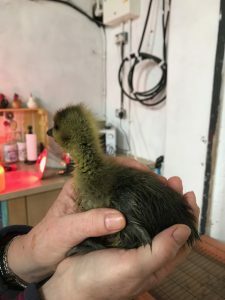 Whenever we incubate eggs we always incubate extras to hatch here at Hens HQ just incase the hire doesnt go to plan, plus it means that we get chick cuddles! 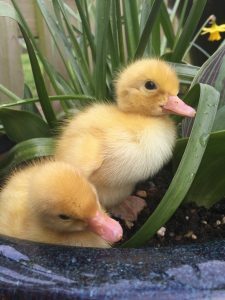 We will be hatching until the end of June, we will also be hathcing ducklings too! It has been a blustry few days here at Hens HQ. We lost a lot of roof tiles off the farm buildings and there was some minor damage to the barns. 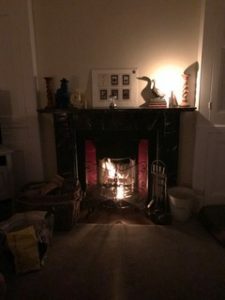 Good old Doris also took out the electricity to the farm, plus 3 surrounding villages. This time of year is hathcing season, so the master incubator has been working hard warming up the eggs. We lost the electricity at 1pm, the incubator can cope with the power being out for a couple of hours (as long as its not opened). 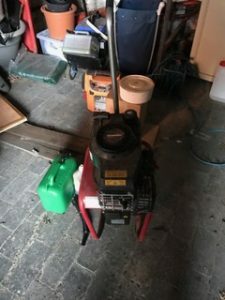 Once we had passed the 2 hour mark we cranked up the little emergency generator and got it back up to temperature. The little genie did a fantastic job for 3 hours and after a visit from Western Power & a walk around the farm we spotted the problem. 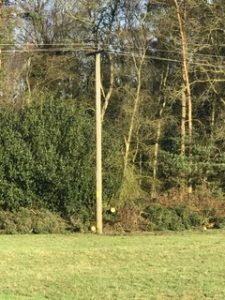 A tree from the ajoining wood was ‘leaning’ on the power lines. 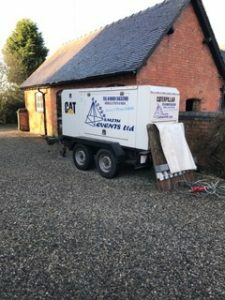 The engineers sprang into action and lots of vans and equipment arrvied at Hens HQ. Whilist all this was going on our very kind friends at Storer Smith Marquees Hire came and set up one of their fantastic generators to keep our incubator running overnight. Thanks to the hard work of the electrical engineers we got our power back at 4am and they didnt even make a mess in the field! Its very eggciting here at Hens HQ. We head back out on the road tomorrow to set up our first incubator hire of 2017. 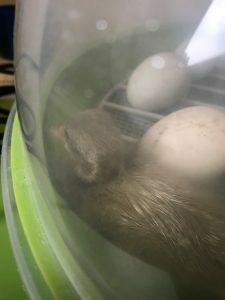 We have had our first arrivals as 2 little quail chicks hatched yesterday. To keep up todate with the pitter patter or tiny feet please visit our Facebook and Twitter pages. Fingers crossed that from 28th February the hens can head back to school as Defra are relaxing the current regulations in some areas. At Hens HQ the safety and welfare of our hens is our paramount concern. 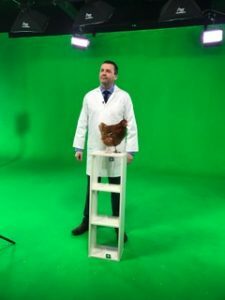 All of our hens will be going back to school weith a Bird Flu Prevention back to make sure they stay safe and healthy at school. I wont lie it will be lovely to get them back to school where they belong and out of the barn. 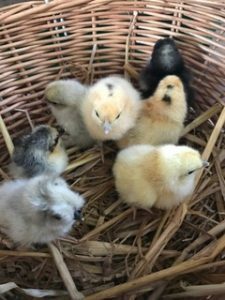 March is going to be a busy month with getting hens to schools, new schools joining us and of course on the run up to Easter its hatching season! The hens have now been on AI lockdown since mid December. They have settled into barn life much better than I could have hoped. As discussed in some of our other articles we have been working hard to stop the hens from getting bored. 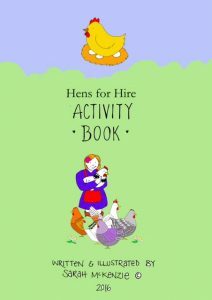 As well as edible treats we have also added some other activities for the hens. They have rubber tyres to play in and recently added each pen has its own musical instruments! Im not sure I will be conducting an orchestra just yet but the young hens seem to be enjoying it. 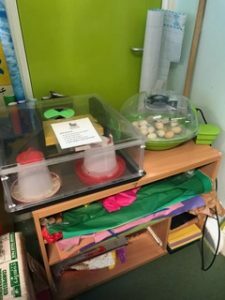 All schools who have booked incubator hire with us will ahve had confirmed dates of when your eggs will be arriving at school. We are now fully booked for Incubator Hire until the end of June 2017. 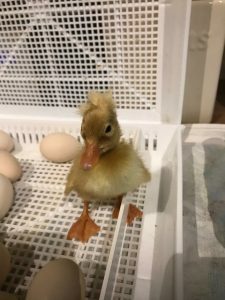 If you want to hear the pitter patter of tiny fluffy feet, we will be offering incubator and hatching eggs until the end of October 2017. 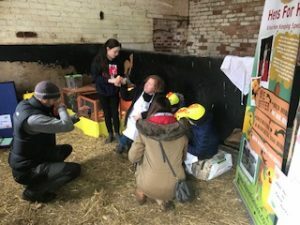 We host a monthly Hens for Everyone Courses, a great way to get find out everything that you need to know to be a hen keeper. Check out the Courses page for more information. With a lot of help we finally have our own You Tube Channel! 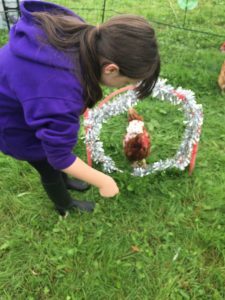 We have already started to add videos of what the hens are up to whilst they are in the barn at Hens HQ. Please have a look at Hens for Hire HQ n You Tube! Just like all other poultry up and down the country the hens are 6 weeks into the Defra lock down. I think they are glad to be out of the mud and rain but have been getting very bored. We have been doing our best to keep them busy, in each run they have plenty of space to scratch around in the deep woodchip, They ahve tyres and chicken swings to play with. Everyday they get a mix of scratch feeds-corn, garlic powder, grit and seaweed. They have access to water and layers pellets and in the afternoons a selction of fruit and veg, kale is very popular at the moment. As they are in the barn and it can be a little dark on dull days we also have some large lights to make it daytime bright. I have on order for them a selection of musical instruments to add to the pens next week! We do love happy hens! As all the hens are at Hens HQ until the end of next month we have rather a lot of eggs. We have been selling some of them at our honesty box at HQ and from this week we will be posting them out to schools. We have also delivered a large cardbaord box of eggs to the YMCA food bank in Burton on Trent, we will be doing this on a regular basis until the hens go back to school. 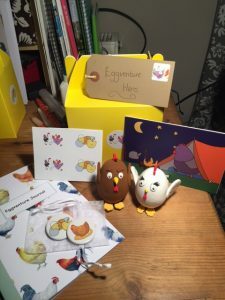 We can bring the hens into the classroom for fun filled days all around the humble hen. 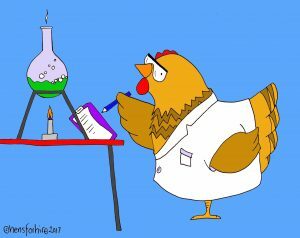 Egg Scientists-Time to put on the lab coat & do eggperiements! 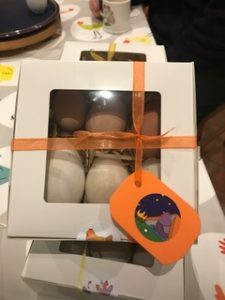 Please visit the Eggtivity Day Page for more information! Yesterday Defra announced the extension of the Prevention Zone until 28th Feb. All poultry should be housed all food and water out of the reach of wild birds and runs should be enclosed. Biosecurity should be followed for more information please visit the Defra website. 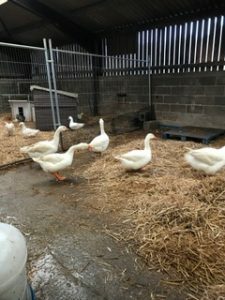 Here at Hens HQ, we have moved everyone into the large Chicken Barn along with the ducks and geese. All the doors have been covered with netting and we have footbaths. The hens have settled in really well, the geese will be happy to be back out the grass once the prevention zone is ended. 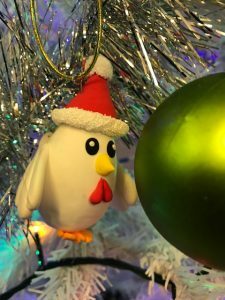 We take the spread of Avian Flu very seriously and have decided to extend the Christmas holidays of the school hens until the end of the prevention zone. 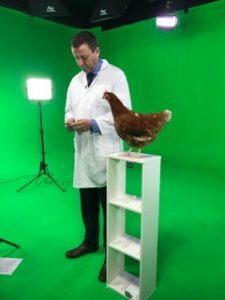 To keep all the school up to date with their hens we will soon be starting our own You Tube channel and a weekly EGGcast. December 2016 has been a bit of a challenging one. We have fully embraced the new Defra regulations and have done our best to move all of the hens indoors to our large Chicken Barn and covered all of the gaps with netting. We have used netting that is normally used to cover ponds. The aquatic shop looked a little surprised when I walked in on the morning of 6th December and bought all of their netting. Mr P and Daniel did a great job up the ladders after school securing it all whilst I got the pens ready for the ducks and geese. Now the geese haven’t been here very long and I have never kept them before. Until this point they had started to accept that I bring the food and the water and had gone from flapping and hissing at me to just the odd hiss. On the evening of the 6th December I was very impressed that they happily herded across the yard into the barn and the new pen. There new home is next to the ducks and the have plenty of space to move about. Sadly they have gone back to hissing and flapping at everyone who comes in and out of the barn. The ducks that we have raised from day old ducklings were having none of this ‘herding into the barn’ business and had to all be picked up and carried into the barn. I can report that the hens are all enjoying life in the barn. Happy to be out of the mud and rain with lots of woodchip to scratch around in. We also have lots of hand washing gel and boot washes for coming in and out of the barn. We have had a lovely CHICKmas here at Hens HQ, the hens have hung up their stockings for Santa and got all the treats they had on their list. We are now getting prepared for the start of 2017. 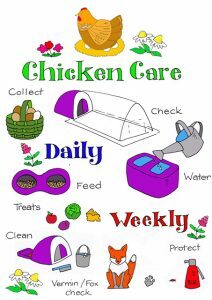 We are putting together ‘prevention zone packs’ for when the hens go back to school once the prevention zone has finished. 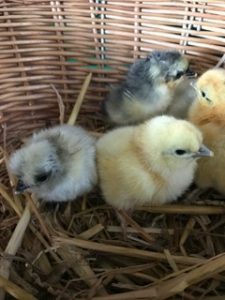 Along with the Hatching Plan for 2017, competition for our schools for term 2 and 3,it’s going to be cracking! Thinking of getting hens and not sure where to start? Why not attend one of our courses. We cover everything you need to know for Happy, Healthy Hens! You get lots of hen hug, cakes and a goodie bag! For more information and to book please visit the ‘courses’ page. 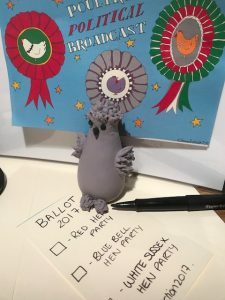 Hatching Options 2017…its going to be a ‘cracking’ year! Are you ready for an EGGventure? 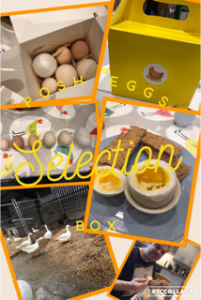 Continuing our literacy project this term we have just launched a trial of our EGGventure Boxes. They are full of goodies to get students imaginations fired up and get them writing! 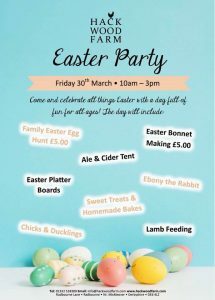 More information to follow…….its all very EGGciting! 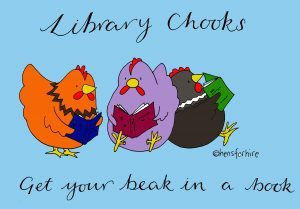 Have you meet our Library Chooks? Now you know that we are hen crazy here and are firm beleivers that hens enrich every part of our lives at home and school. 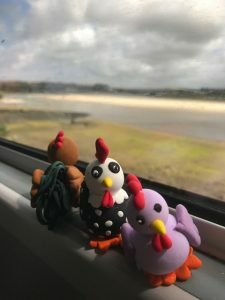 As part of our Chicken Club, (our online resource centre for schools that hire with us or those that want to join) our new literacy programme, the Library Chooks. To help children with guided or unguided reading, go read a book to your Chooks! During November we have will be hosting 4 Christmas Craft Workshops here at Hens HQ. 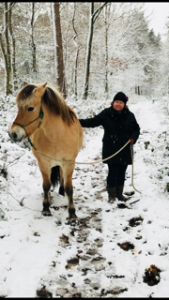 All the courses are lead my our creative artist in residence Pat Lings, she will show you how to create some stunning works or art to give and Christmas gifts or to decorate your home. 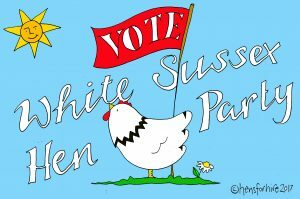 As its at Hens HQ there will be lots of tea, cake & optional hen hugs! All the courses are held in our dairy workshop, we have have onsite facilities along with ample parking. Due to the age of our building I am sorry we do not have disabled access. For full details and to book please visit the shop. 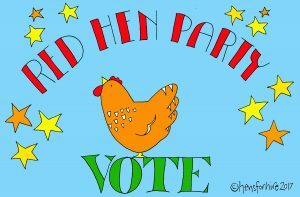 Join the three wise women here at Hens HQ on Thursday 22nd September, A hen night with a difference with Three Wise Women, a brood of hens, tea, cake and networking. We are meeting at the HQ of Hens for Hire, a brilliant business owned by Claire Peach (aka The Hen Lady). 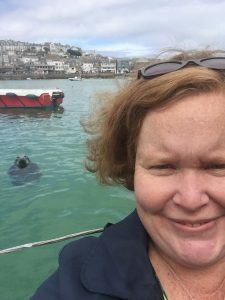 Find out more about her business and meet other local business women. We will had an eggcellent time at the show. 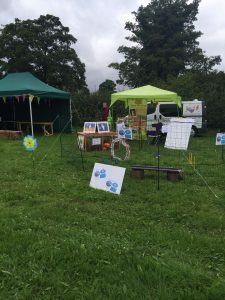 The Egglympics ‘Have a go at Hen Agility Course’ proved very popular with everyone visiting our stand. We have had a lovely start to the Summer holidays. The hens are all back at HQ so we have plenty of fresh eggs! We are busy cleaning eglus and equipment ready for them to go back out to schools in September. 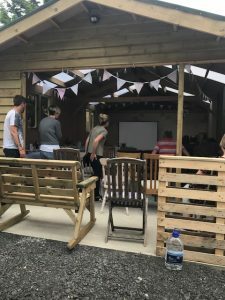 We have hosted some great courses so far this Summer, the ‘mini mites course’ was great for recapping on how to treat your hen house and hens for the little monsters. 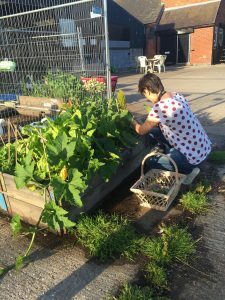 We also have a very successful ‘Hen Herbs & Chooktails’ evening sharing the herbs from your garden. We covered the herbs you can feed your hens along with what can be added to the hen house. 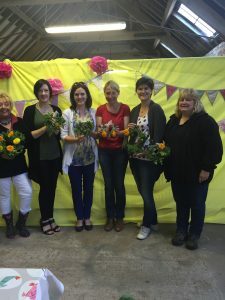 We made some lovely wreaths to hang in the hen house plus plenty of Pimms! 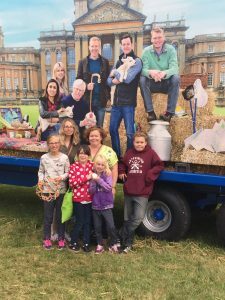 At the start of August we visited Country File Live in Oxfordshire. 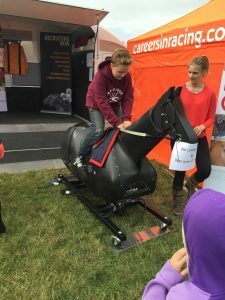 We have a lovely day our and enjoyed the fantastic activities the kids took part in kayaking, horse racing and polo. We ate some tasty street food and amazing ice cream! I also got to visit some of my twitter friends Poultry Talk & Dr Chicken, as part of Adam’s Farm. Yes its true we even managed a family holiday! 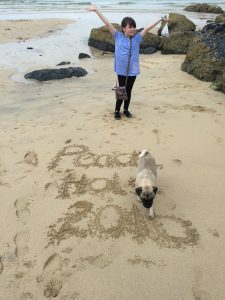 Many thanks to my Mum for looking after Hens HQ whilst we were at the seaside! Yes it is finally Summer! (well in name) we have some fantastic evening mini courses here at Hens HQ. 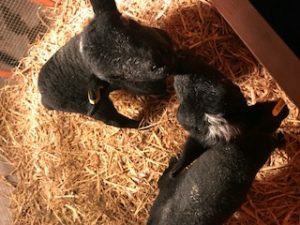 Mini Mites Course is perfect to refresh you on what to do to deal with mites in your flock and hen house. If you are new to hen keeping, it will give you all the knowledge you need! All in a relaxed environment, light refreshments included plus 10% off mite products in the shop. 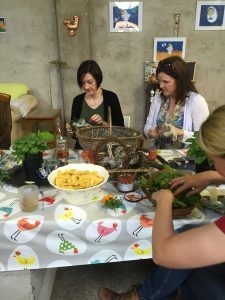 Hen Herbs & ‘Chook-Tails’ to celebrate turning 5, we will be sharing the different herbs you can use with your hens and hen house and making a herb ring to take home. We will also enjoy some evening cocktails, alcoholic an non alcoholic. For more information and to book please visit the courses page from the SHOP. 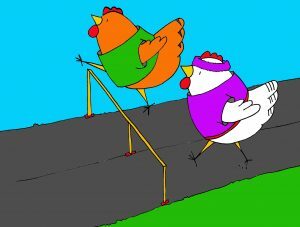 Our hens and pupils are getting into shape as part of this terms Egglympics competition. To celebrate a summer of sport and the 2016 Olympics in Rio. 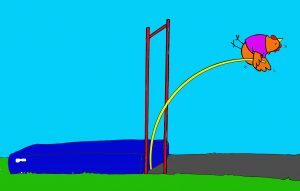 The challenge for the schools is to train their hens to complete some obstacles and send us the video. Not wanting to be left out we have been having a go at Hens HQ. You can watch our training videos via our Facebook & Twitter pages. Our top tip for Hen training is……GRAPES! definitely the right treat to motivate the girls to join in! Also keep the training short and sweet! Good Luck, we can’t wait to see your videos! I know that sounds a long way off but here at Hens HQ we are already busy planning our hatchings for next Spring. 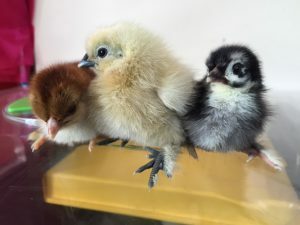 Also for all settings that hire incubators you will have the option to ‘Watch us Grow’ a fantastic opportunity to see the chicks develop into young adult birds. It s the start of the new school year and we have been really busy with hens returning to school and starting at new schools. We hope all the hens are settling in well and both students and staff are enjoying the hens and the fresh eggs. If your school would like to buy a hen package, have it set up at your location and staff trained please get in touch. We were thrilled to be featured in the Guardian Newspaper back in March this year. Being able to share what we do with so many people has been wonderful. If you have a minute or two, have a look at the full article here. Quails are a fantastic addition to your hen hire package. We provide everything for the care of the quails and full training and support to look after them. 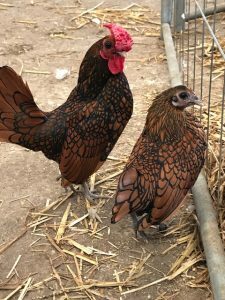 Here at Hens For Hire HQ we have hens of all shapes and sizes, you birds we are growing on to join the school hens, girls who have retired plus a few of my favourites! 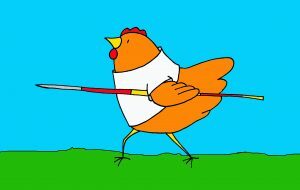 If you follow us on twitter you know we are also promoting hen re-homing through the British Hen Welfare Trust. 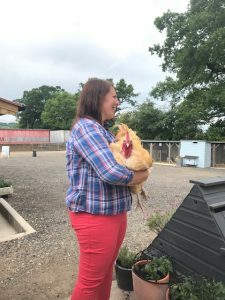 We decided to adopt our own hens through the BHWT website, its a great way to hug a hen if you haven’t got room for some at home. Meet our girls…Minerva and Little Flo.